As the years have gone by, my kids and I had a lot of fun, making Christmas crafts for the Christmas season! It just gets us into the holiday mood! Not to mention that we're making all kinds of fun memories together! Would you like me to make it super easy on you? You don't have to spend all kinds of time scouring the internet for the perfect crafts to do. They're all right here in my handy little Christmas Crafts e-book! You can get immediate access to this for $3.97! Here’s what you can expect in the e-book: 25 different craft projects, enough to where you can do them as a Christmas countdown! They are easy enough for little kids to do, but fun enough for bigger kids to do, too. 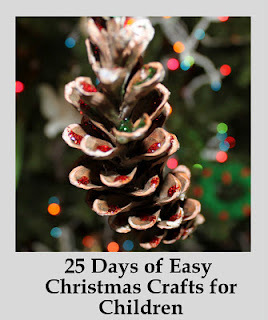 Some of the crafts you can expect are: Silver Star Ornaments Christmas Coasters Laced Christmas Garland Christmas Pine Cone Ornaments (like the one pictured above) Cotton Ball Snow Men Rudolph Candy Canes Christmas Place Mats Dough Ornaments Hand Print Wreaths Christmas Book Marks Christmas Pinecones ++ Many MORE! Included in the E-book, are a couple of templates, a shopping list and directions for each craft. Are you ready to have some fun with your kids?